Dr. Aliyu Abubakar Tanko was born in the 60s. From Kaduna State, a highly self-motivated individual with several years of working experience with local and international organizations among youth and student bodies. He has an extensive knowledge on Hajj Education and Orientation. He has worked with Kaduna State Muslim Pilgrims Welfare Board. He obtain a PhD in management Studies with practical skills in Human resources Management in Usman Dan Fodio University Sokoto. He is married and blessed with kids. Ensuring Compliance of organisations with the policies of National Hajj Commission, Federal Government and the Saudi authorities. Settling of disputes arising from Hajj and Umrah operations. Advertisement in the National dailies at the end of Hajj exercise for complaints of any kind with regards to the Hajj. Distribution of Performance Status Report (PSR) to the State Pilgrims’ Welfare Board and agencies and Chief executives of the tour operators to be filled and returned. Umrah monitoring during Ramadan onshore and offshore. Born in late 60’s. He attended University of Ilorin to obtain B.Art Islamic studies and MPA. He has over 19 years working experience in public organizations and currently the heads the licensing division. Experience: He worked as a producer at Osun State Broadcasting Corporation (OSBC) Oshogbo from 1997 to 2011. 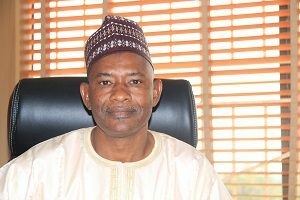 He joined National Hajj Commission in 2011. He initially worked in the office that liaises with States Pilgrims’ Welfare Boards across the Federation and NAHCON zonal offices. He has also headed the Tour Operators division before being deployed to Licensing. He has attended seminars, workshop, conferences Nationally and Internationally on hajj and umrah matters. Ibrahim Idris Mahmud was born on 31st October, 1969. His educational qualification includes B.Ed in Arabic, PGD in International Relations & Diplomacy, and MPA. He is happily married with kids. Aviation Unit which is headed by Alhaji Mohammed Goni Sanda. The unit is responsible for Schedule of Flights and General aviation matter for the Hajj operations.